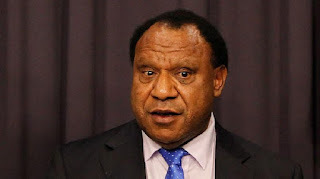 Foreign Minister, Rimbink Pato, has committed to Papua New Guinea advancing measures to stop human trafficking and modern-day slavery in the APEC Region. Accompanied by Minister for Immigration and Border Security, Hon. Petrus Thomas MP, Foreign Minister Pato was speaking at the Bali Process Government and Business Forum in Perth, Australia, last week where he said action that will save lives must be stepped up. “Human trafficking is a scourge, a blight on humanity, and an anathema to the free world,” Foreign Minister Pato said to the audience of Ministers and business leaders from 45 countries. “From the poorest to the most developed countries, right now, people are being trafficked and their rights denied. “We all have a role to play, regardless of the size or power of our country or Government. “In Papua New Guinea, we have uncovered people smuggling crimes, and working with our partners including Australia, we have interrupted these activities and made arrests. Foreign Minister Pato said Government cannot tackle the problem of human trafficking on its own, but must work with the private sector, and the upcoming APEC Transport Ministerial Meeting in Port Moresby will advance this agenda. “We have to work with the transportation industry to interrupt supply chains and networks in this awful trade in human misery. “In October this year, Papua New Guinea will host the 10th APEC Transportation Ministerial Meeting. “APEC has been proactive in encouraging collaboration, through the APEC Anti-Corruption and Transparency Working Group, to combat the problem of human trafficking in the Asia-Pacific region. “Considering transportation networks are exploited by traffickers, I expect our engagement through APEC will make an important contribution to dealing with this problem. “I will convey the outcomes of this Bali Process forum to Papua New Guinea’s Transport Minister, to be presented at the 10th APEC Transportation Ministerial Meeting in Port Moresby. “There is no place for human trafficking and smuggling in the modern world, and Papua New Guinea will take the strongest stand to detect, apprehend and prosecute the criminals involved in this vile practice.